When we made the decision to relocate here, it was because of the scuba diving. I could write anywhere and being in a place with an active military base was not one of our criteria. It would have been a nice “plus”, but unlike quite a few people we know, it was not a deciding factor. Even though Homestead Air Reserve Base (HARB) has few benefits for us, in our work with the community paper, we always have “first cut” on any military related event. When people ask us if we miss the military, the answer is, “no”, as our time has come and gone. That doesn’t mean we don’t tell “war stories” as all of us are prone to do. It is nice though to occasionally spend time around the military and yesterday was one of them. The U.S. Army Parachute Team, the Golden Knights, come here for three months each year for their winter training. 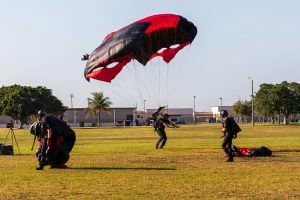 They appear at different events and this year for the first time, they invited other teams to come in for this final week for them to do what is referred to as joint and interoperability training. That means training with units you don’t normally train with. In this case, they had two other Army teams – one from Fort Bragg, NC and one from Fort Benning, GA. The U.S. Navy team was in from San Diego, CA, and the U.S. Air Force Academy Team from CO. The British Team rounded things out. It was tiring, but fun and the piece I did for the paper was short since it was primarily a photo opportunity. I did take pages of notes though since I had the extra time. Last Saturday was worse than usual from a time-management perspective. Hubby had to guide a dive, but the Camera Club was also having a tent at the City’s Eco Fair and that happens to be our tent. So, I had to drop the tent and other items at the park, then go to a nearby location to cover a story for the paper, then get back to the museum (across from the park) to open it early since the Eco Fair started at noon and our director doesn’t usually come in until 1:00, the regular time. Then it was a late lunch, take lunch to Hubby who had come straight from work, and home for a bit to get ready to go to the football game in my Chamber of Commerce Board Member role. (We did only stay for the first quarter, but that took us until almost 8:30) This litany is not to garner sympathy, but rather to semi-explain why I wasn’t wildly enthusiastic about going to cover the story. Except, this is another of those occasions where I met a young woman with a remarkable story. The piece will run in tomorrow’s paper. This is actually a follow-on to the post about STEM and STEAM. I just sent in the article for this week’s South Dade News Leader, so consider this as an “insider” preview. Each year non-profit grants are awarded by the Community Redevelopment Agency (CRA). These are special funds put in place after Hurricane Andrew that will expire in another few years. The CRA has different grant programs and one is focused on non-profits that support education, enrichment, etc., within a specified area of town where many families struggle economically. There are always more applicants than funding and the committee carefully reads all proposals to determine which ones are most likely to be able to have an impact and responsibly manage the funds. Even though there are moments when trying to juggle writing for the paper and other things is tiring, getting to meet people like Brandon is always worthwhile. I have mentioned before we don’t really do musicals, but have been to some of the performances at our Seminole Theatre to support the theater. In view of the fact we’ve had almost non-stop events and company all the way through Jan 2, looking at our tickets for the show F”orever Young, Your Life, Your Music” on Jan 4th gave us pause. On the other hand, we did have the tickets and we did have time to enjoy dinner before going to the theater. There was a decent-size crowd, but timing no doubt affected a number of decisions about attending. We said hi to friends, chatted with the theater director who told us it wasn’t really a musical; more like a music revue. Okay, we’re good with that. What a great time we had. “Based on a true story” doesn’t always mean that, but for the sake of this, we’ll assume it’s close. Five guys who love playing baseball together in NYC hang out in a basement and all discover different songs they really love. They go through all the teen things one goes through, certain songs making memories. The five split into their separate ways; a couple of them in fact as singers; one a baseball player. At some point, they each come to realize music is what they are truly passionate about and want to have a shot at. 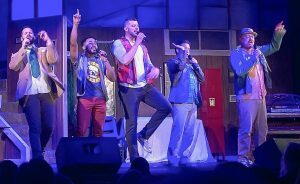 They individually start performing, and ultimately make their way to Branson where there are lots of singing gigs available. One of the guys teams with his brother to capture all this by creating Forever Young. The 2-hour show with intermission was not-stop, high energy, and incredible voices. There is narration as opposed to dialogue, but everything flows together seamlessly and the range of songs are from the 1950s to more or less current. It was a terrific evening and I’m glad we went. Forever Young is set in a NY basement. Great show. One of the guys on active duty reached out to the newspaper publisher to tell him about Joyce Kutsch, one of two women to be the first to go through U.S. Army Airborne training in 1973. That was during the initial phases of closing out the Women’s Army Corps (as well as the other women’s services) and integrating women into the regular services. Jump school, as it is commonly referred to, has never been easy. Yes, people who sky dive for fun can go out and get a quick lesson, especially if they’re planning a tandem jump of jumping together with a professional. Military jumping is quite different and in Joyce’s case even more so. She was to go to jump school because it was a prerequisite to being a parachute rigger. This was one of the male-only fields (except for necessity during WW II) opened to women in 1973. 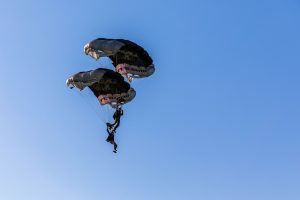 While the specialty does mean packing parachutes for soldiers, it also involves packing for equipment drops; everything from pallets of supplies to vehicles. Try figuring out how to rig a 5-ton truck for a drop and you get the idea of skill required. In addition to being a rigger, Joyce was assigned to Fort Bragg in support of the 82d Airborne Division and finding a more testosterone-filled unit would be difficult. Like many “inadvertent pioneers” at the time, Joyce wasn’t looking to make history, but she and the other women weren’t going to let skepticism and derision nor the intense physicality of the training/follow-on duties stop them. Despite forging the way for other women, Joyce didn’t stay for a career and she wound up here and has been a postal carrier for more than twenty years. Interviewing her was a delight and we’ll be staying in touch. For most people today, the idea of women in the military is considered so normal they don’t realize the different women’s services were actually in effect until the 1970s. In other words, the Women’s Army Corps (WAC), the Women’s Army Nurse Corps, Women Accepted for Voluntary Emergency Service (WAVES) for the Navy, and Women’s Auxiliary Air Force (WAAF) were all separate organizations with distinct rules as to how women could be assigned and were controlled by women. The structure was for women to be assigned only within the female service and while they had duty assignments with men, they came under the administration of other women. There were also rules such as a woman could be married, but not remain in service if she had children. As I’ve mentioned in other posts, I came in during the transition period when women were being phased into the regular services and therefore I met a number of senior women who had only been familiar with the separated services. As usually happens in a major organizational shift, there were those who looked forward to the new opportunities and those who were not able to adapt. There was of course tremendous resistance in some cases, both male and female who didn’t think integration could be successful. It was probably true there was more reluctance on the male side because they had difficulty in imagining women could handle jobs in traditionally male fields. Part of the transition was the restriction of women going into branches of Infantry, Armor, Artillery, Field Artillery and Combat Engineers. Those branches were restricted until such time as they could work out physical requirements and the psychological impact of women being placed at the “front lines”. As the type of warfare shifted so “front lines” became blurred, the very real issue of physical requirements for certain things also underwent changes due to technology advances. Some tasks that required brute strength such as lifting 50-plus pound artillery rounds were made easier by auto-loaders. In other cases, there is simply no way to lessen the muscle-driven demand. It’s not that some women aren’t as strong as some men; they, however, are the exception rather than the average. And so, when people ask me if I think it’s fair when women are still restricted from specific duties, my response is, “the mission must always come first”. I often do a post after I submit an article for the paper when it comes to non-profit groups. Almost everyone who writes for our weekly paper is a stringer, but we do have more-or-less “beats”. It’s no surprise I focus on the military, but also non-profits, certain aspects of education, and generally heart-warming things. I do, at times, get the heart-breaking as well, but thankfully those are less frequent. In this case, there was a piece I intended to do months ago, but other topics kept bumping it back since it wasn’t time-sensitive. Among our tourist attractions, we have the Everglades Alligator farm with air boat rides, plenty of gators and so forth. When the kids were here right after Christmas, we thought two-and-a-half for Amelia was probably still a bit young for that, but we also have the Everglades Outpost Refuge. It is actually on the way to the other and I thought it would be more age-appropriate. A plus was that before son was diverted by his passion for dance, he intended to be a wildlife ecologist and work with restoring animal habitats. So off they went and had a wonderful time. Their description of the place was far different from what I was expecting and I mentally filed away a story. 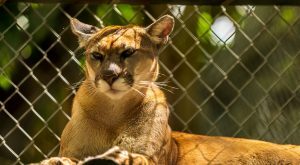 In essence, they are on “speed dial” for the Florida Wildlife agents and they are linked with other groups around the state. The resident camel that certainly can’t be released into the Florida wild was at another place in Florida and the owner was having too many issues with him. The three gray wolves (mostly wolf with a little bit of dog) were born into captivity, yet again, they aren’t native to Florida. They’ll be in residence unless someone else is willing to adopt them. As I mention in the article I did for the paper last week, there is never a shortage of good causes to support. This is one I can vouch for if helping wild animals is something you care about. Another Musician From Our Time…. Ah, Aretha Franklin, whom I never heard in concert, but did admire. A voice lost to us as have been others in the past few years. Now, as I mentioned a few months ago, we did go see Jimmy Buffet and the Eagles together in concert which was amazing. In fact, last night we went to one of our regular restaurants that has this one guy who plays and sings on Thursday. He takes requests, but mostly does 60s, 70s and 80s with the mix of Croce, Fogelberg, Atlantic Rhythm Section, etc.,. He was good and those songs do bring back memories. I have often said you know you’re getting older when you are in a music section and look at the top songs unable to tell what the title is from the name of the band. Or you don’t even bother with the Top Tunes stations and instead have Classic Rock or something similar as your pre-programmed stations. C&W is a little different because in general, the top selling new artists aren’t terribly far afield from those of the 70s and beyond. Granted, you go back to the 50s and there will be some noticeable changes. At any rate, The Queen Of Soul did give us some great songs and I say Rest in Peace with all respect. I would say I can’t believe nearly an entire week slipped past me, but there’s been a fair amount of turmoil swirling around the non-profits I work with and some other obligations. The irony of course is this is “the slow time of year” for a number of organizations/individuals. As I’ve explained in previous posts, that doesn’t hold true for Hubby and me. The summary is a young man who was a very promising athlete had swapped from track and field into football. There was no doubt in anyone’s mind he would be a college star with a decent shot at the pros. That was before the automobile wreck where his two best friends were killed and he was left paralyzed from the waist down. You can imagine the impact on the families and fellow students. This is a “small town” despite a rise in population and the track and field coach for one of the other high schools knew of the young man’s athleticism. No one here is involved in adaptive sports, but the coach was sure Isaac would have the ability if he was willing to make the effort. They worked together for him to focus on wheelchair races, discus, javelin, and shot-put. Not only has he excelled, he is being invited to be a motivational speaker by some notable area athletes. In raising money for him to be able to go to the Junior Olympics last week, he brought home more medals and made more contacts. The hope is he can get a scholarship to one of the colleges/universities where they have an adaptive sports program. In writing for our community paper (weekly), I mostly cover community and military subjects (hardly a surprise). Therefore, I know a lot of the non-profits and like as today, there are stories which I then sometimes also post about in the blog. I think most people are familiar with Habitat for Humanity and the article I’ll be working on this weekend has to do with a “Blitz Build”. (Before I proceed, we have been supporters of this organization for many years. It meets all the criteria we look for in a large non-profit.) From a logistics perspective, these builds are impressive. From a human interest story, they’re even harder to beat. Hubby participated in one several years ago, when I was on one of the extended business trips I used to take. He had a great time, learned how to cut and hang drywall, and yes, still has the tee shirt. Anyway, Blitz Builds are usually two weeks in duration and ten houses are built during that time. If you’ve ever seen the movie “Witness” and the scene with the old-fashioned barn raising, it’s the same concept on a larger scale. Volunteers, Habitat for Humanity staff, and the homeowners spend the two weeks starting from bare ground. Licensed professionals are brought in for certain tasks of course, but everything that can be done by semi-skilled, unskilled individuals is completed by volunteers and the potential new owners. The program is an excellent example of a hand-up, not hand-out. In order to qualify for a house, the homeowner/homeowners must be able to qualify for the mortgage, but there is no monetary down payment nor interest on the mortgage. The homeowner must however work for 250 hours on a combination of their house as well as others. This accomplishes three primary goals of 1) giving a true sense of ownership, 2) “paying” the down payment in sweat equity, 3) having/acquiring a far great sense of what it will take to maintain the house once it’s finished. People not familiar with how the program works often believe the houses are given away, but that is not the case. However, because of the criteria for eligibility and the process they use, default on mortgages of Habitat houses runs about 2% which is far below the national average. The particular piece of property this build is on actually has had other builds and the ten houses to be turned over to new owners tomorrow completes the total build-out of 65 houses. That means 65 families who might never have been able to afford down-payments/mortgages will be homeowners. You can go onto https://www.habitat.org to see great photos of these builds and read the individuals’ stories. Having Perrier in the Desert…. Charlie Hudson on Slight Delay…..
Fiona at Ice Bear Quilts on Slight Delay…..